Newenglandwaterfalls.com aims to make your waterfalling experience as easy, safe and enjoyable as possible. To help you decipher what you can expect with each trip and each waterfall, this website includes simple characteristics to each individual waterfall chapter. These characteristics are useful to obtain a quick summary of the adventures that lay ahead of you. Each of these characteristics is clarified below. Waterfalls are rated on a scale of one to five stars. A rating of one star identifies a waterfall lacking in many categories. These waterfalls are not impressive, nor are they photogenic or scenic. A rating of five stars, on the other hand, is for those special waterfalls that really deserve praise because they offer so much. If a particular waterfall has a rating of five stars, you can expect an extraordinarily photogenic waterfall located in a wonderfully scenic setting. These waterfalls are bound to make a lasting impression on all who witness them. Each and every waterfall on this website deserves your time and attention. If a waterfall carries a rating of two, it does not mean that it should be excluded from your plans. It only suggests that you may want to supplement this particular waterfall with others falls or attractions in the area. For the dedicated enthusiast, every waterfall is a new and special place. After visiting waterfalls across the region, six distinguishable types of waterfalls have emerged. Block—a cascade, wider than it is tall, that usually covers the entire distance across a stream and drops at a near vertical angle. Blocks are often referred to as being “classic” or “horseshoe” style falls. Cascade—a series of small drops, too many to count feasibly, that fall at a low angle of descent. Just about every type of waterfall usually has cascades shortly upstream or downstream from it. Fan—a steep-angled cascade that fans out from a narrow width at the top to a larger base at the bottom. Most fans are also horsetails in that they maintain contact with underlying rock during their descent. Horsetail—a nearly vertical drop characterized by waters maintaining constant or almost constant contact with the underlying rock that they are flowing over. This is essentially a very steep set of cascades. Plunge—a waterfall in which water drops at an entirely vertical angle. Water flows over a broad ledge, usually an overhanging one, into a pool without making contact with the underlying rock during its descent. Punchbowl—a special type of plunge characterized by water being forced to a very narrow width and being squeezed down into a pool. There are very few punchbowls found in this region. One of the first pieces of information people want to know about a waterfall is how tall it is. There is a tendency for individuals to believe that there is a direct correlation between height and beauty. This is simply not the case. Some of the premier waterfalls are less than 20 feet in total drop, and one is a mere 6-foot drop. 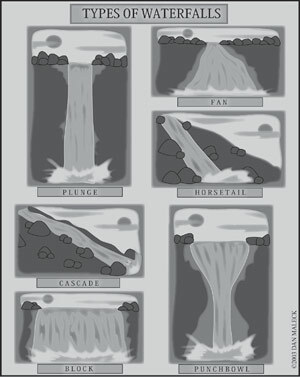 In determining the height of the falls, the major drops were separated—if they were distinguishable—or the entire formation was lumped into one total drop. Some heights have been accurately measured, but others have been reasonably estimated. In all cases the height reflects the elevation drop and not the total horizontal distance over which the falls travel. This defining characteristic informs you which brook, stream, creek, or river is feeding the formation. Several of the waterfalls described in this guide have water sources that are either unknown or so seasonal that they have never been assigned an official name. All trail lengths listed are one-way, representing the distance from trailhead to the waterfall, unless otherwise noted. Some trails are loops, and they reflect the total hiking mileage covered on the trip. Before undertaking or deciding to skip a particular hike, consider other trail factors, such as altitude gain or loss, and trail difficulty. For instance: A 3-mile round trip with no altitude gain is much easier on your body than a 2-mile round trip with a 1,000-foot elevation change. A trail length of “less than 0.1 mile” usually indicates that the waterfall is either partially visible or not visible at all from the parking area. The trails described in this guide are categorized into one of five levels of difficulty: easy, easy side of moderate, moderate, moderate side of difficult, and difficult. To determine each hike’s difficulty rating, the following factors were taken into consideration: trail distance, altitude gain, trail dangers such as the scale of muddy and slippery travel, and any other challenges present that must be overcome, like crossing a river. All of the ratings are conservative, based on family-friendly hiking. Travelers with years of hiking experience on rough trails can probably downgrade the hiking difficulty by one level. Easy—generally flat, stable-foot terrain, with no significant obstacles or difficulties. These trails are perfect for families and safe for all. They may also be handicap-accessible, but this is not always the case. Easy side of moderate—hikes that may involve a fair amount of navigating over rocks and roots on the trail. There also may be some elevation gain, mud in springtime, or sections of slippery travel after periods of rain, but nothing too difficult. Moderate—trails offering some degree of challenge, whether it be significant altitude gain or steep and slippery stretches of terrain, or both. Moderate hikes may still be appropriate for families and children, but personal judgment should be used. Depending on the length of the trail, water and snacks should be carried, as these hikes are usually longer and more time consuming than trails with lower ratings of difficulty. Moderate side of difficult—only a handful of New England’s waterfall trails approach a difficult rating. For those trips rated as moderate side of difficult, you may face demanding altitude gains or short bushwhacks where no formal paths exist. You may be required to wade across a knee-deep river or scramble down a steep gorge wall. A hike need not be long in terms of distance to earn this rating. If you are embarking on such adventures, you should probably think about carrying some water, food, and other supplies with you. These hikes are generally not suitable for children or pets. Difficult—any trail deemed difficult is reserved for the truly experienced. This type of trip may require extensive off-trail navigation or involve very steep or dangerous terrain. If you are not in great physical shape and familiar with such challenges, skip these hikes—there are scores of other waterfalls with less potential for problems. If you choose a difficult hike, you should consider bringing ample food, water, and even some company in case of emergency. These hikes are not suitable for children or pets. The approximate hiking time is based on a commonly followed hiking formula: A mile can be covered in half an hour, and for every 500 feet of elevation gain, an additional half hour is added. Extras, such as the time required to cross a river, scale a steep embankment, or scramble down a riverbank, also add to the amount of approximate hiking time. As you might expect, the estimations in the guide can differ from the actual time it will take you to reach a waterfall. The approximations in the guide are based on the average person’s pace of travel: about 2 miles per hour. Experienced hikers may be able to cut down a travel time by nearly half; conversely, a family with children might need nearly double the amount of time. Take note that approximate hiking time is for one-way travel. If you are wondering what the entire trip might take you, double the hiking time given and allow some time for exploration and enjoyment at the waterfall. For loop trails, the hiking time reflects the entire trip. For the majority of waterfalls described in this guide, the altitude gain or loss on the trail was the prevalent factor in determining trail difficulty. For every 1,000 feet of elevation gain, average-paced hikers can expect to add about half an hour to their one-way trail time. The trails that gain significant elevation in a short amount of distance can be hazardously slippery and muddy during the wet season. Unless you are prepared for the worst, avoid hiking trails that feature 500 or more feet of elevation gain over less than 2 miles of length in early spring. Examples include Beaver Brook Cascades of New Hampshire, Dunn Falls of Maine, and Race Brook Falls of Massachusetts—all three are sure to supply too many dangers to allow a pleasant overall experience during this season. The best time to visit each waterfall is primarily determined by the seasonality of the waterfall, or how much water-flow is present in each season of the year. Water flow alone is not always the determining factor; often, waterfalls are just plain inaccessible during certain times of the years, due to road closures, operating seasons (where an entry fee is charged), or trail hazards in winter. For those waterfalls designated seasonal, the best time to visit is typically from April to June, but be aware that some northern locations may not be snow-free until the middle of May. It is possible (and often thoroughly enjoyable) to swim at many waterfalls in New England, especially those found in the northern states. The quality of swimming has been labeled on each waterfalls' page on this site. The scale is as follows: "Not Possible and/or Prohibited" to "Poor" to "Good" to "Great" to "Excellent" to "Outstanding". Only the very best swimming holes will earn an "Outstanding" rating. For a list of the best swimming holes that have waterfalls, click here. The map coordinates for each waterfall as they appear in each states' DeLorme’s Atlas and Gazetteer have been provided. There is an atlas for each state in New England (be aware that Connecticut and Rhonda Island share one). These maps can be purchased on Amazon.com or at many bookstores throughout the region. The thought behind adding the map coordinates to the chapters in the guidebook was to make it simpler for you to plan your day outside; this in turn can allow you to visit multiple waterfalls in a day. Be aware that only about half of the waterfalls that are described in the guidebook or on this website are actually marked by name on these maps. Each waterfall chapter and page on this website indicates whether the waterfall is "marked" or "unmarked" based on the latest versions of each map (as of the summer of 2009). An "unmarked" response indicates that the waterfall is contained within the grid, but DeLorme has not yet published the exact location of the waterfall. DeLorme is either unaware of most of the waterfalls across New England, or they would like to keep many of them a secret. Many waterfalls in New England are handicap accessible. The majority of these are waterfalls are viewable from the roadside, but there are some that have short and easy paths. Each waterfall page includes a "yes" or "no" as to whether or not it is handicap accessible. For a list of the best handicap accessible waterfalls in New England, click here. 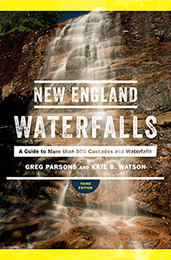 This field lets you know if the particular waterfall is included as an individual chapter or within the final appendix/index of the 3rd edition of the published guidebook, New England Waterfalls: A Guide to More than 500 Cascades and Waterfalls. If the response is 'Included in Guidebook', it means that the waterfall is included as a separate chapter within the book, complete with trail information and detailed directions. In such cases, the published book will contain more information this than website. If the response is "Included in Guidebook Appendix", it means that only basic information is contained within the final appendix/index of the book. In such cases, this website will contain more information than the published guidebook. Each waterfall page on this website indicates whether dogs are allowed or are prohibited. Even if dogs are in fact allowed, please keep in mind that waterfalls can be dangerous places. It is a best practice to keep pets leashed at all times around waterfalls. There have been several instances over the years where dogs have fallen down waterfalls, including a few incidents where owners have chased after them and been hurt or killed themselves. Also, be aware that more and more places are starting to require proof of rabies vaccination before pets can be allowed into parks or campgrounds. Unfortunately, not all waterfalls are free to visit. Several are located on private property where the owners charge an access free. Many in the White Mountain National Forest of New Hampshire and Maine are reached by trailheads that are part of a parking pass program ($3/day). Some waterfalls are VERY expensive to visit, examples being The Flume-Pool Loop (part of "The Flume") and Paradise Falls (part of the "Lost River") in New Hampshire and Kettletown Brook Falls in Connecticut.